LOS ANGELES -- Video shows former Olympian Bruce Jenner rear-ended two cars, pushing one into oncoming traffic in a fatal Malibu wreck that is under investigation, a law enforcement official told The Associated Press on Wednesday. Jenner was hauling an off-road vehicle on a trailer behind his Cadillac Escalade on Feb. 7 when he steered to avoid cars slowing for a traffic light in front of him on the Pacific Coast Highway, the official said. His SUV struck a Lexus sedan and sent it into the opposite lane. The driver, Kim Howe, 69, was killed when it was struck head-on by a Hummer. The official was briefed on the video but was not authorized to speak publicly and talked to the AP on condition of anonymity. The official said it also showed that Jenner's vehicle continued forward and rear-ended a Toyota Prius. Officials initially said the Lexus had struck the Prius. Several other people were hurt in the pileup, including an infant and two young children, CBS Los Angeles reported. 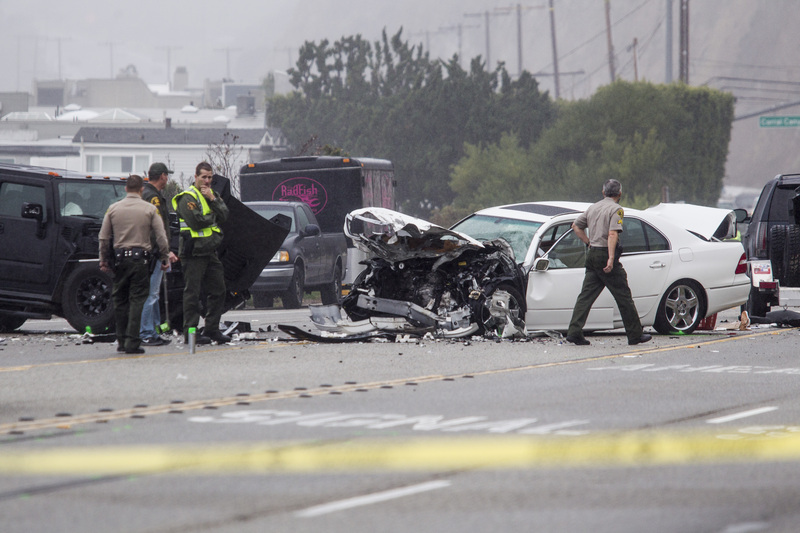 PCH was closed for more than nine hours as investigators examined the crash scene. Jenner was being followed by paparazzi at the time, but they did not play a factor in the crash, sheriff's officials said. Investigators have sought cellphone records to see if any drivers were distracted, but the video appears to show that Jenner was not using his phone. His spokesman Alan Nierob has said Jenner was not texting and is cooperating with investigators. The 1976 Olympic decathlon champion better known these days as Kim Kardashian's stepfather passed a field sobriety test, but also submitted a blood sample to determine if he was intoxicated. Jenner released a statement the day after the crash, calling the accident "a devastating tragedy" and vowing to cooperate with investigators. "My heartfelt and deepest sympathies go out to the family and loved ones, and to all of those who were involved or injured in this terrible accident," Jenner said. "It is a devastating tragedy I cannot pretend to imagine what this family is going through at this time. I am praying for them."